Comb Honey is the perfect food in which to observe the bees handiwork. Round or square comb sections are placed in the hive. The comb is then drawn out by the bees into perfect wax cells. Bees fill each cell with nectar, which matures to honey and is capped over for storage. All this happens inside the comb honey package never being touched by human hands! You might remember comb honey from when you were a child when you would chew the gooey sweet instead of chewing gum! 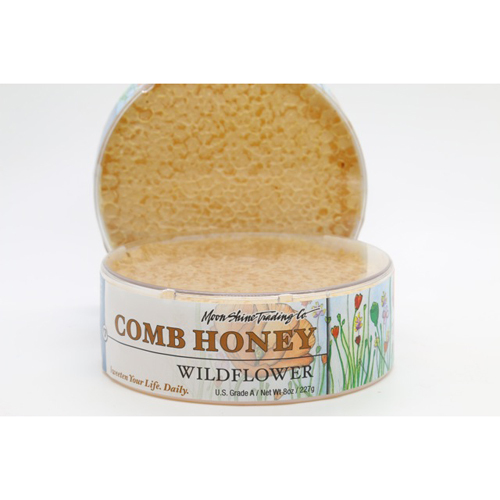 Comb Honey makes a terrific spread for cornbread, muffins, waffles or pancakes. Serve it with a sharp cheese and fruit. Always delightful!